“I think Republican primary voters are with the president,” Cornyn says in the same WaPo article, to explain why he supports Trump’s markedly unpopular shutdown. There are over 15 million registered voters in Texas, and only 10% of them voted in the 2018 Republican Primary. There are over 28 million constituents in Texas. Yet this measly fraction of the electorate terrifies John Cornyn so much that he’s paralyzed into inaction, reduced to gibbering inanities to the national press. “I didn’t run for office, and people didn’t elect me and others, to preside over shutdowns,” Cornyn told the WaPo, sounding briefly sensible. “They elected us to govern, and this is all about politics right now.” Then he concludes, bizarrely, that Democrats Nancy Pelosi and Chuck Schumer need to end the standoff by negotiating with the hostage-taker-in-chief. 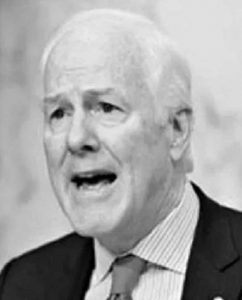 Cornyn evidently feels his job as Senator involves no obligation to 13.5 million of his constituents, and no responsibility to negotiate with, or exercise any kind of Constitutional check upon, the leader of his own party. It’s nice work if you can get it, John. But your performance review is coming up in 2020.